The strongest impression that one gets from a reading of Hamlet's Mill is that the mythological records are records of naturally occurring astronomical events. 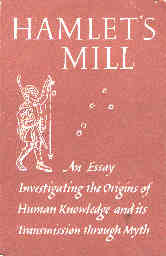 The evidence the authors present spans the globe from the Maya to the Danish, from the Eskimo to the Hindu people. In all the mythologems is found a common thread, the anthropomorphic and theriomorphic conversion of stars and planets into actors in a cosmic fairy tale. This book provides a complete explanation of the Precession of the Equinoxes and the order of the progression from Gemini to Taurus to Aries to Pisces and finally into the Dawning of the New Age: Aquarius. It explains how the ancients could perceive this progression and weave the signs of the various ages into their interpretation of events occurring on earth. The Minotaur, the Ram's Horn of Moses, the Sacrificial Lamb of Jesus take on new significance when related to their occurrence in time with each of the Great Ages. What will be the signs of the new age dawning of Aquarius and the waning of the Age of Pisces? The fish kills around the earth and the outpouring of water (at a physical level: floods; at a spiritual level: love). For this invention will produce forgetfulness in the minds of those who learn to use it, because they will not practise their memory. Their trust in writing, produced by external characters which are no part of themselves, will discourage the use of their own memory within them. You have invented an elixir not of memory, but of reminding; and you offer your pupils the appearance of wisdom, not true wisdom, for they will read many things without instruction and will therefore seem to know many things, when they are for the most part ignorant and hard to get along with, since they are not wise, but only appear wise. "If the terrain differs from the map, believe the terrain." In a world of precipitous drops to icy fiords, this is excellent advice. One should walk as a Norwegian Boy Scout in this world where daily language is busy creating maps, ever diligent and ready to pause and inspect the terrain, before proceeding based on the information from a map. Tune in, inform yourself of the territory and walk with the confidence that only the local inspector of the terrain, you, can have.